Malaysia is one of the biggest producers of natural rubber. The fresh latex, tapped from the rubber tree (Hevea brasiliensis), known as field latex, is a cloudy white and viscous liquid containing rubber fraction and non-rubber components. As a basic raw material in rubber processing, fresh field latex undergoes a series of procedures during its conversion to either dry rubber, or high concentrated latex. To prepare high concentrated latex, ammonia is usually added to the field latex upon reaching the factories to prevent coagulation. Ammoniated latex will then undergo centrifugation which yield high concentrated latex and a by-product named ‘skim latex’. Skim latex is considered as low value by-product and usually discarded as waste effluent. However, it must be first treated in the oxidation treatment pond, before the clearer water can be released into the main waterways. In Malaysia, the discharged water must meet the strict requirements of MS ISO/IEC 17025:2005. Eventually, the rubber manufacturers have to spend a lot of money for waste management and effluent treatment of skim latex. Therefore, utilization of this wasteful skim latex is one of the economic saving measures and may minimize the environmental problems. 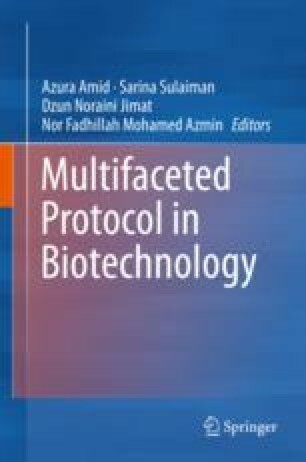 This chapter aims at delibrating the use of the serum of skim latex as an alternative nutrition for culturing microorganism. As a model microorganism, this study has selected to use Bacillus lichenformis (ATCC 12759). Skim latex serum was used as the basal media, supplemented by some selected medium composition (lactose, galactose, casein, KH2PO4, MgSO4 and LB broth) for the production of extracellular protease. At the end of the study, it was demonstrated that skim latex serum is able to fulfill a criteria as an efficient culture media due to its abundance, low cost, stable in quality and having a stimulatory effect on bacterial growth. Therefore, valorization of this wasteful skim latex into protease enzyme is hoped to be an introduction for further inventions relating to processes suitable for microbial culturing.